Veneto Vetro has always been present in the world of religious architecture thanks to the high performance of its products. Both churches and individual clients consult our company for the supply of modern artistic stained glass for churches, headstones and burial places. From curved to sound-absorbing glass, Veneto Vetro is able to meet all regulatory requirements for public buildings and personal tastes of our customers. 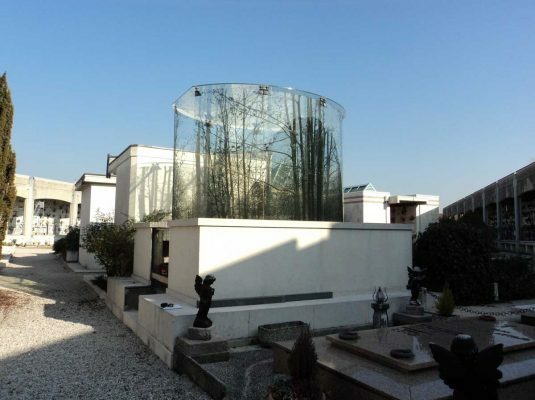 Thanks to the use of Cromoglass®, Veneto Vetro is able to implement impressive projects for religious architecture. Ceramic colors and the very high resolution of digital printing are often requested by architects and designers who deal with this type of commission. With our windows, it is also possible to reduce heat loss as much as possible and to optimize technical performances. The decorated double glazed windows that Veneto Vetro can provide a perfect thermal and acoustic insulation, impossible to obtain with traditional stained glass windows.